The kids in Julie Blackmon's firecracker of a photograph, "The Hamster Handbook," have staged a scene on the floor of a screened-in porch: a miniature house with books for walls and small, furry pets scurrying within. Blackmon's scene, too, is staged, a domestic tableau scattered with small people acting out their self-defined roles and animal instincts. Both the play and the play-within-the-play nest inside the larger drama that is everyday life, Blackmon's ultimate theme and inspiration. Based in Springfield, Mo., and part of a large extended family there, Blackmon uses home — backyards, attics, garages — and the rituals that unfold there as the raw material for a body of work begun nearly a decade ago. The large color prints in her show "Down Time" at Fahey/Klein Gallery date from the last five years. Each frame is an absorbing, meticulously orchestrated slice of ethnographic theater, starring a Midwestern tribe of scuffed and diapered blonds. 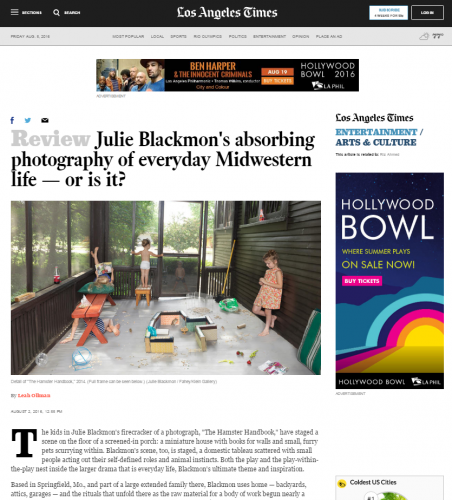 Blackmon works in the same vein as Jeff Wall and Gregory Crewdson in creating vivid, persuasive photographic fictions. The artist she commonly cites as a chief influence, however, is Jan Steen, a 17th century Dutch painter whose witty and spirited tableaux, set in taverns and kitchens, often illustrated moralistic proverbs. Like Steen, Blackmon imposes compositional order on familiar, ordinary disarray. Each locale opens out to us like a theater set to its observing audience. Each scene is loaded with resonant details that thicken the sense of place and implied narrative.